Intermediate amyloid oligomers of lysozyme: Is their cytotoxicity a particular case or general rule for amyloid? In the current study we investigated the molecular mechanisms of cytotoxicity of amyloid oligomers of horse milk lysozyme. We have shown that lysozyme forms soluble amyloid oligomers and protofibrils during incubation at pH 2.0 and 4.5 and 57°C. These structures bind the amyloid-specific dyes thioflavin T and Congo Red, and their morphology and size were analyzed by atomic force microscopy. Monomeric lysozyme and its fibrils did not affect the viability of three cell types used in our experiments including primary murine neurons and fibroblasts, as well as neuroblastoma cell line IMR-32. However, soluble amyloid oligomers of lysozyme caused death of all these cell types, as estimated by flow-cytometry counting dead cells stained with ethidium bromide. The primary cell cultures appeared to be more sensitive to amyloid than neuroblastoma cell line IMR-32. Amyloid cytotoxicity depends on the size of oligomeric particles: samples containing 20-mers formed at pH 4.5 were more toxic than tetramers and octamers present in the solution at pH 2.0. Soluble amyloid oligomers can self-assemble into doughnut-like structures; however, no correlation was observed between the amount of the doughnut-like structures in the sample and its cytotoxicity. The fact that the intermediate oligomers of such an abundant protein as lysozyme display cytotoxicity confirms a hypothesis that cytotoxicity is a common feature of protein amyloid. Inhibition of intermediate oligomer formation is crucial in preventing amyloid pathogeneses. Original Russian Text © M. Malisauskas, A. Darinskas, V. V. Zamotin, A. gharibyan, I. 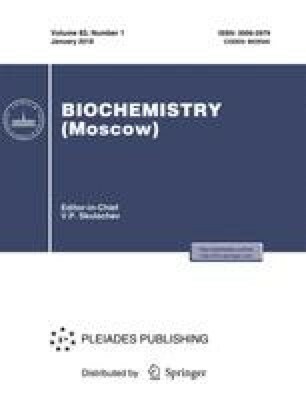 A. Kostanyan, L. A. Morozova-Roche, 2006, published in Biokhimiya, 2006, Vol. 71, No. 5, pp. 626–635. Originally published in Biochemistry (Moscow) On-line Papers in Press, as Manuscript BM05-230, February 19, 2006.